Yahoo! 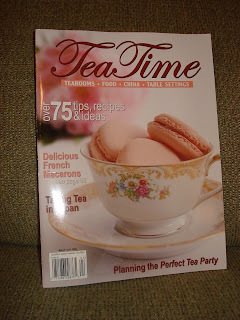 My March/April issue of Tea Time Magazine arrived in the mail today! I always look forward to receiving each issue, but I was especially anticipating the arrival of this one because I knew in advance it has a lovely article written by a New York online tea friend and an article with beautiful photographs of a fabulous tea party given by a California online tea friend. A bonus I was not expecting, is the cover photo of delicate French Macarons (macaroons). Oh, I have delightful memories of tasting these delicious macarons in London at Laduree, the French cafe in Harrods last March. My photograph of the macarons is not quite up to magazine cover quality, but it is special to me. Join me for a cup of Harrods English Afternoon Blend as I ease into my favorite recliner and savor this special magazine for the next hour. After all, it is tea time, isn't it? Oh, the macaroons! Marvelous! I don't subscribe, but will go pick this up! 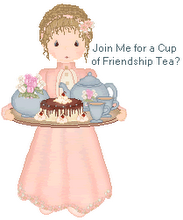 Also, in Tea, a Magazine, Nancy R's tea strainers are featured! ;-) Such cool tea connections throughout!